When it comes to casting, it is really important as a director to know your characters. You don’t want to just cast your friends. When it came to casting for The Teacher Project, we had an edge. One reason why is because I also wrote all the episodes for The Teacher Project. So I really knew the characters mainly because I had put them on paper. I’d like to say I created them, but in reality I didn’t. They were already created. I have been teaching for 14 years and I have gotten to know a lot of great teachers in that time. The task was to take certain teachers who had strange or unusual quirks and bring them out in the characters for The Teacher Project. Each one has some good comedic value, but they are all based with a sense of realness. Because of this, casting them would be a challenge…at least I thought it would. The key to getting the best potential actors to not to just describe the characters well, but also to describe the project well. A well described project will lure people into believing what you believe, that your project is awesome. By establishing this, you will get the more people to audition, and most importantly, the right people to audition. We were very fortunate to get the right people to audition. The first character we wound up casting was the role of Nancy Childress. She is a quirky, by-the-book type teacher that is married to her job. Nancy doesn’t have much of a sense of humor at all. One of the first to audition was Tracy DeCresie. She had a great audition video, and really captured the essence of the character well. There were several excellent candidates who submitted for the role, but ultimately we kept comparing each one to Tracy. We also cast the role of Mrs. Anderson pretty easily. I thought this role would be the most difficult considering that Mrs. Anderson has multiple personality disorder, and every day is a new character for her. We had to find someone who could literally be a different character every time we see her on the screen. RJ Stallman was the perfect fit. She quite literally has every character in Mrs. Anderson’s arsenal. Bryan Cobaris had auditioned for the lead role as Greg and while we didn’t see him as a fit for Greg, he was a good fit for the role of the principal or the school, Mr. Diggins. In fact, we decided on him and changed the entire character to fit him better. The hardest role to cast was that of Bridgette, Greg’s seven year old daughter. Well, she is only seven in age, but actually there is a teenager living in that little body of hers. So we needed to find someone who could give the sass. There were a LOT of choices, but only one was the best. Emma Rose Jacobson was hands down the winner. She brought the attitude and sass so well, she may in fact steal the show. It helps that she has two teenage sisters as role models. The role of Brooke was pretty easy. We needed to find someone who would help keep Greg grounded. She is head over heels for Greg, even though he doesn’t really look at her in that regard. She desperately wants him to look at her differently, but plays it a little too cool at times. Heather Danner was the perfect choice for Brooke. She understood the character immediately and delivers an amazing performance in each episode. The final choice we had to make was that of the main character, Greg. Greg is essentially burned out. He has been teaching for 14 years, but as he says it, teaching years is like dog years, so it’s more like 98. We had to find someone who could be a loving single father to Bridgette, but express the loss of motivation at his job. It came down to two candidates. Both had a great audition. Both had a good teacher-style look. It was a difficult choice, but we chose Chuck Fonshell for the part. The ultimate tipping of the scale was Chuck’s ability to sell the sarcasm. He did a brilliant job. Chuck has brought the character to life in a way that we couldn’t have imagined. Every one of these characters, and their unique traits, came out very well in the Pilot Episode. 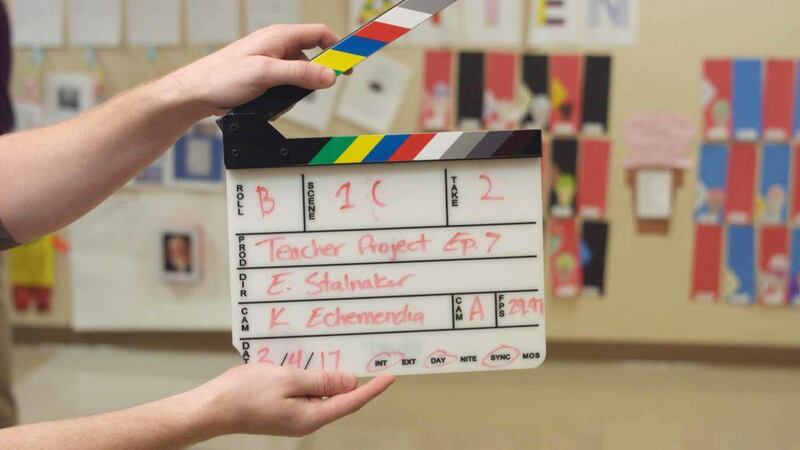 The Teacher Project was ready to start filming.